– Sharon Tucci, President and Founder, Talent-Plus, Inc. Some kids just got it. They’re born singing and never stop blossoming. 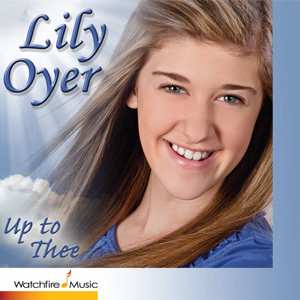 Teenage singer/songwriter Lily Oyer debuted her first inspirational album, Up to Thee, at age 12, with clear-as-a-bell vocals that sparkle with light and soothe the soul. At 6, Lily made her stage debut and hasn’t turned back. At 9, she began serving as a visiting church soloist and discovered the joy of blessing those seeking healing. She and her pianist/composer mother, Laurie Bay Oyer, love to write and perform together. Lily expresses the harmonious blend of the sweetness and innocence of youth blessed with the maturity of a rich artistry. Influenced by Celtic Woman and Taylor Swift, she not only has an uncanny ability to hit notes with pinpoint precision, infuse them with powerful grace, but she loves every phrase, leaving you feeling better after listening.